February is the host to Sharon Salzberg’s 28 day “Real Happiness Meditation Challenge,” an online event designed to help both beginning and experienced meditators “#Commit2Sit.” Of course this year is a leap year, so we get an extra day to strengthen our meditation muscles! 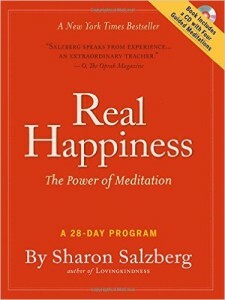 The challenge is inspired by her bestselling book Real Happiness: The Power of Meditation (A 28 Day Program). This title rolls off my tongue whenever beginning meditation students ask for book recommendations. Not only is the book accessible, easy to understand, and full of very clear directions, it is also bundled with a CD containing four guided meditations. After all, reading a book on meditation won’t get you very far. It is the practice that matters. Real Happiness features two introductory chapters that introduce the reader to the type of people that seek out meditation training—from an active duty soldier in Iraq to a stepmother committed to her new extended family. The author makes it clear that although our life situations may be different, we share a similar longing to be healthy and happy. The 28-day program is broken into four weeks and themes. Each week contains written instructions and has a corresponding guided meditation available on the CD. One of the most helpful features in the book is the FAQ section offered at the end of each chapter. Salzberg draws from her decades of teaching people how to meditate to offer wise answers to some of the most common questions a beginner might have, and even a few doozies. During week one, Salzberg skillfully strips away the mysticism that surrounds mindfulness—often thought of as some esoteric practice–and shares practical advice on how to deal with the myriad of distractions that arise during practice. As a meditation instructor myself, I know firsthand that distraction is one of the greatest hurdles beginning student will tackle. Many people give up on meditation altogether after just one or two tries because “my mind won’t stop thinking,” or “there are too many distractions.” Salzberg assures the reader that the distractions are not a problem in and of themselves. If you have to let go of distractions and begin again thousands of time, fine. That’s not a roadblock to the practice-that is the practice. That’s life: starting over, one breath at a time (p. 50). Week two teaches mindfulness of body, including the body scan, walking meditation and how to mindfully drink a cup of tea. It really is remarkable how disconnected so many of us are from this physical house we embody! Whether you are inhabiting a strong and healthy body without pain, or are burdened with aches or illness, the instructions in this chapter will help shift your perspective and drop habitual attitudes towards your body. Week three—perhaps the most challenging and insightful chapter—focuses on how to deal with thoughts and feelings, and even difficult emotions. So often people think that learning to meditate means shutting out anything less than pleasant, but that would be delusional—the opposite of mindfulness. If the purpose of mindfulness meditation is to help us reduce suffering and indeed attain happiness, then difficult thoughts, feelings, and emotions must be acknowledged, but in a skillful way. Real Happiness offers clear direction on working with, rather than fighting, strong feelings. Finally, in week four, the reader learns how to cultivate compassion and true happiness with lovingkindness. This practice of sending well wishes deepens our connection to self and others, and for many practitioners cultivates a feeling of warmth and joy. Lovingkindness for a difficult person is about seeing what happens when we recognize a connection with someone instead of focusing only on our feelings of conflict; when we pay attention to that person’s suffering and not just his or her transgressions (p. 157). The final chapter titled “Keeping the Practice Going” reminds us that meditation is a practice, and to get the most from it, a daily one at that. Salzberg writes, “even when you know that these benefits make meditation well worth the effort, it can be hard to keep up a new meditation practice (p.183).” This is so true. Even during a four week course I see some students stay with the practice, and others drift away. As a teacher, I long for my students to stick with it, but as a fellow human being, I totally get it. It helps to have an aspiration. It also helps to have loving support from other human-being-meditators. This is why I love the annual “Real Happiness Meditation Challenge.” It is a chance for those who have drifted away from their meditation practice to begin again, with support and structure—and Sharon Salzberg’s infectious humor. I encourage you to pick up a copy of Real Happiness: The Power of Meditation (A 28-Day Program), and join this year’s event. After all, with it being leap year, you’ll get that bonus day of practice! And if you live in Frederick Maryland or nearby, join one of our three Introduction to Mindfulness Meditation courses starting in February 2016. This book will jumpstart your meditation training, and augment the class nicely.